Yoav joins the Silicon Valley Tennis after moving from Vermont. Yoav is a PTR Certified Tennis Instructor and 19 years on-court experience. 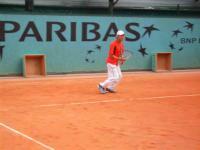 Yoav also developes, organizes, and coordinates tennis education programs. 10 years as a touring coach with both national and international circuits including grand slams.Top Players and Coaching Credentials Include: All 4 Junior Grand Slams, ITF Juniors top 5 boys and girls in the world, USTA top 5 Boys and Girls 14,16,18. ITF/WTA top 200 in the world. Enjoys spending time at the park, listen to music, and just soaking in the California sun.